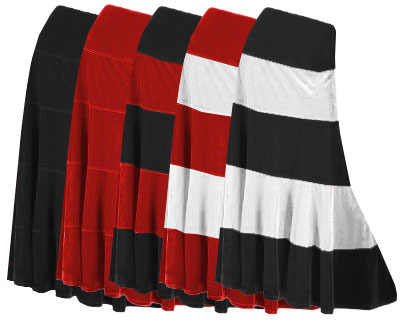 These are absolutely gorgeous plus size skirts. It is in a tiered style, and has an elastic waist band. It is very pretty, the picture just doesn't do it justice! It is made out of what looks like soft crush velvet, but it is actually a washable poly blend! It has some stretch to it, very stylish! Machine-washable; polyester blend; made in USA.